You can come over to the dark side this season, as black is seen everywhere on the catwalk. I can hear you think: 'but black is always on trend' and that's right, but for this fall you can think of a more gothic inspired look. And the variations are endless! At Givenchy, for instance, we saw a really nice contrast between masculine and feminine. Leather, blood red and lingerie tops came back frequently. 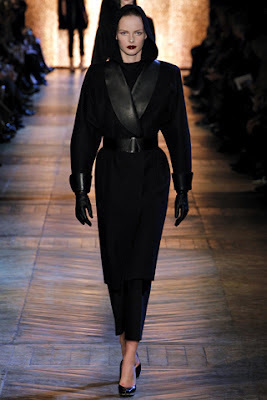 At Yves Saint Laurent we saw a strict silhouette including a wasp waist and bold schoulders. That made this collection very powerful, strong and brave, but still classic at the same time. The show also got a dark feeling because of the multiple use of leather (of course), chains and the motif of the calla lily, which was also used in the jewelry. The calla lily is a Roman symbol for lust, but were also laid on the graves of those who suffered an untimely demise. The collection of Yohji Yamamoto was all about contrasts and playing with volume. Also assymetric and draped dresses passed in review. Gucci brought it in a whole diffrent way. Frida Giannini said she found inspiration in the 19th century. The collection got a very romantic and bohemian feel about it, complete with long and graceful dresses. You see: there are many ways to make this trend your own and you know, fashion is all about personality!